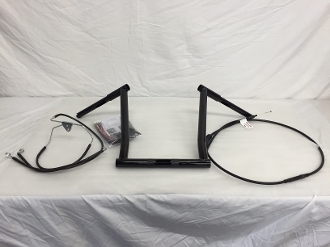 2015-2019 Road Glide Road 6 Customs NAKED handlebars 15" x 1 1/4" and complete cable kit! NOTE! DUE TO THE HIGH DEMAND OF CABLE KITS IT COULD BE A FEW DAYS BEFORE YOUR ORDER WILL SHIP. THANK YOU FOR YOUR PATIENCE.